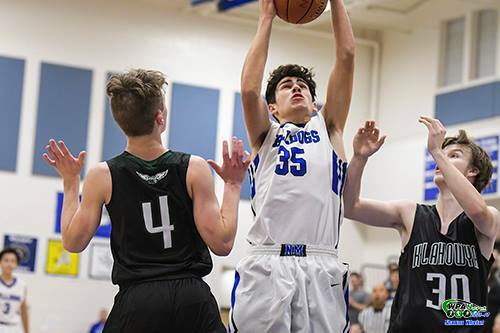 The North Mason basketball teams swept Klahowya Wednesday night. The Lady Bulldogs had little trouble with the Lady Eagles winning 51 to 17. The boys from Belfair pulled away from Klahowya late for a 49 to 41 victory. MasonWebTV Powered by HCC broadcast both games. Bulldogs’ Natalie Mathews (#4) takes a shot defended by Eagles’ Kylie Woodrum (#10) & Kayla Hendricks (#22). NM’s Alaya Brown (#13) following the play. Click the picture for more photos from the game provided by Shawna Weland.. 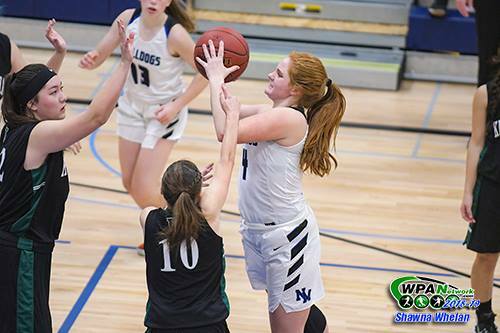 In the girls’ game, North Mason took advantage of 36 Klahowya turnovers, held the Eagles to single digit scoring in each quarter and dominated to start the season 2-and-0. Natalie Cartensen led the way with 14 points. Jullian Maiuri chipped in 10 points – 8 in the fourth quarter. Bulldogs’ Ryan Crookshank (#35) going to the hoop between the Eagles’ Garbriel Smith (#4) & Lucas Becker (#30). Click the picture for more photos from the game provided by Shawna Weland. The North Mason boys opened their game on a 10-0 run and led 13 to 3 after the first quarter. Klahowya responded in the second, holding the Bulldogs to four points while scoring 13. Halftime score: North Mason 17, Klahowya 16. The third quarter saw the boys from Belfair go up 7 but the Eagles rallied and the quarter ended tied at 28. In the fourth quarter, both teams had four-point leads early but North Mason pulled away late building a 13-point lead. Klahowya was able to trim that to six points but time ran out on the Eagles. The Bulldogs got a huge game out of Miller Campbell who scored 10 of his game-high 18 points in the fourth quarter. Troy McCormick, who was quiet in North Mason’s opener, finished with 12 points. And Brice Solis added 10 points. The boys from Belfair improved to 1-and-1 on the season despite 22 turnovers. North Mason takes on Shelton Friday. The ladies in Belfair. The boys in Shelton’s Mini Dome and on MasonWebTV Powered by HCC. The Shelton boys’ basketball team opened the season with a 70 to 61 win at Mt. Tahoma Wednesday. The Highclimbers overcame a slow start as the T-Birds held the ‘Climbers to seven, first quarter points to build a 10-point lead. Shelton rallied in the second quarter, out scoring Mt. Tahoma 22-14 and trailed 31 to 29 at the half. The third quarter was closer but the Highclimbers found themselves down by a point. The ‘Climbers pulled away from the T-Birds in the fourth quarter outscoring them by 10 points. 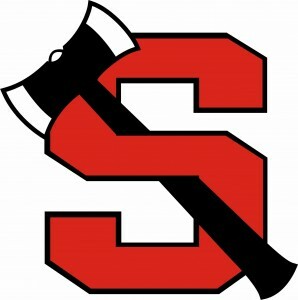 Shelton hosts North Mason Friday in a game that will be broadcast by MasonWebTV Powered by HCC.